NEW ORLEANS – The 2018 collegiate track & field season is in the books. 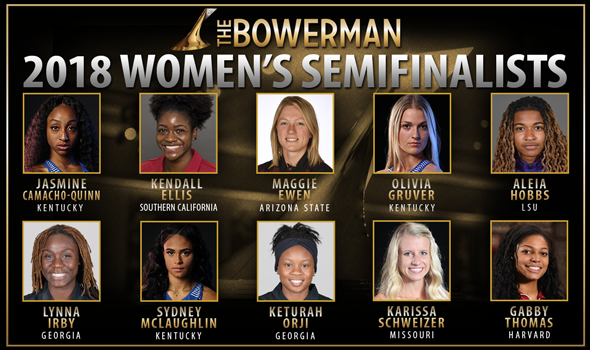 But the seasonal accomplishments of 10 women will live on as their feats at the NCAA Division I Outdoor Track & Field Championships in Eugene, Oregon, last week – as well as their accomplishments throughout the 2018 indoor and outdoor campaigns – landed them on the list of semifinalists for The Bowerman. A total of 12 outdoor titles were claimed by the 10 semifinalists, which were announced by the U.S. Track & Field and Cross Country Coaches Association on Wednesday, while 19 performances at Historic Hayward Field from the semifinalists were in the top-five of their respective events. Each of the women put together stellar indoor campaigns prior to the outdoor season, as well. From this list of 10, three will be selected as finalists for collegiate track & field’s highest honor, which will be awarded in San Antonio on December 20 at the USTFCCCA Convention. Jasmine Camacho-Quinn JR Kentucky Sprints North Charleston, S.C.
Three women took home multiple championships at the outdoor meet in Georgia’s Keturah Orji, Arizona State’s Maggie Ewen and LSU’s Aleia Hobbs. Orji, who had already set the indoor and outdoor collegiate triple jump records while picking up a triple jump national title during the indoor season, added to put an exclamation point on her collegiate career in Eugene by becoming just the third woman in NCAA Division I history to claim outdoor titles in the long jump and triple jump in the same season. The product out of Mount Olive, New Jersey, took home her first ever outdoor long jump title on the first day of the women’s competition, posting a leap of 6.67m (21-10¾). She followed that up by claiming her fourth-straight outdoor triple jump title with a mark of 14.04m (46-0¾). Like Orji, Ewen made history by becoming just the fifth woman in NCAA Division I history to pick up outdoor titles in the shot put and discus in the same season, including being the first to do so since 2000. The redshirt-senior from St. Francis, Minnesota, captured the shot put title with a heave of 19.17m (62-10¾) just two days before winning the discus on her final throw with a mark of 60.48m (198-5). Ewen had already picked up the indoor shot put national title while setting collegiate records during the outdoor season in the hammer throw and the shot put. Orji and Ewen tied as the NCAA Division I Outdoor Championships meet high scorers with 20 points apiece. Hobbs battled the elements last Saturday to take home a title in the 100. The New Orleanian ran an 11.01 into a rainy headwind on the final day of the meet for her second title of the weekend. Just two days before, Hobbs anchored the women’s 4×100 relay team that posted a 42.25 to win a title. Hobbs totaled three national titles this year after taking home the indoor 60. The senior also tied the indoor collegiate 60 record in addition to helping break the collegiate outdoor 4×100 relay mark. A pair of freshman in Georgia’s Lynna Irby and Kentucky’s Sydney McLaughlin made their marks on Historic Hayward Field with dazzling performances. Irby set an NCAA Division I Outdoor Track & Field Championship meet record in the 400, winning the title with a blistering time of 49.80. Her time bested the previous record of 50.10, set in 2005 by Monique Henderson. The freshman from Indianapolis also recorded a third-place finish in the 200, running a time of 22.92 into a heavy headwind. McLaughlin, the collegiate record holder in the 400 hurdles as well as the world junior indoor record holder in the 400 meters, won her first-ever NCAA title, bringing the 400 hurdles championship back to Lexington. The freshman from Dunellen, New Jersey, ran a time of 53.96, finishing nearly two seconds ahead of the runner-up. McLaughlin also helped the Wildcats place fourth in both the 4×100 and 4×400 relays. Southern California’s Kendall Ellis may have run the highest-profile race at last weekend’s meet. The product out of Pembroke Hills, Florida, anchored Southern California’s 4×400 relay team that needed to finish first in order for the Trojans to win a team title. Ellis ran a 50.05 split, closing the gap in spectacular fashion to sneak ahead of Purdue by seven one-hundredths of a second at 3:27.06 to bring home the team title. Individually, Ellis was the runner-up in the 400 with a time of 50.19 and also helped guide the Women of Troy to a third-place finish in the 4×100. During the indoor season, Ellis snapped the 400 meter collegiate record while picking up national titles in the 400 and 4×400 relay. Jasmine Camacho-Quinn and Olivia Gruver of Kentucky joined McLaughlin in claiming titles on the week. Camacho-Quinn won the 100 hurdles championship with a time of 12.70, while Gruver claimed her second-straight outdoor pole vault title with a clearance of 4.55m (14-11). Camacho-Quinn was also a member of Kentucky’s aforementioned relay teams. Missouri’s Karissa Schweizer swept the 5000-meter national titles this year after her finish of 15:41.58 in Eugene. The Urbandale, Iowa, native also placed third in the 10,000 with a finish of 32:14.94. Saturday’s victor gave Schweizer her third title this season as she also won the indoor 3000. Harvard’s Gabby Thomas, the collegiate indoor record holder in the 200 and the 200 meter indoor champion, rounded out the Semifinalists after a runner-up finish in the outdoor 200. The junior from Florence, Massachusetts, ran a 22.86 into a heavy headwind, finishing just a tenth of a second behind the winner. Thomas also competed in the semifinals of the 100, running an 11.26. Three finalists for The Bowerman will be named on June 20.